A baguette is one of the true icons of the French culinary tradition. The perfect baguette, light with a crusty exterior and a soft, slightly chewy interior, is as sublime a creation as has ever emerged from any oven. 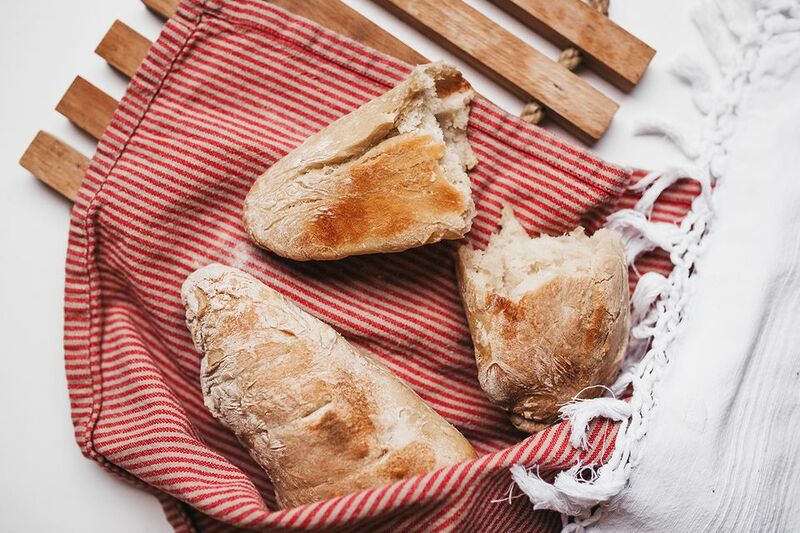 A simple long, thin crusty loaf of bread, the baguette is traditionally made with only water, salt, yeast, and flour. Now, as with so much in the culinary arts, and in baking particularly, simple does not mean easy. You can spend a lifetime mastering the art of the baguette. Getting to know the feel of the dough, and the smell of it, is part of what baking is all about. Even so, just because it takes a lifetime to master doesn't mean you shouldn't give it a try. In fact, you'll probably surprise yourself with how good a job you do, especially if you've ever done any kind of yeast-bread baking before. Combine the yeast and the water in a large mixing bowl. Stir in the salt until it's dissolved. Now add the flour and mix until the dough comes together and pulls away from the sides of the bowl. You'll now have a large, sticky ball of dough. Cover the bowl with plastic and let it sit inside your oven for 12 hours, or until it's doubled in volume. An oven is a good place for this, because it won't get very drafty in there. After the dough has risen, turn it out onto a floured work surface and gently shape it into a flat oval. Don't use too much flour, though. You want the dough to stay sticky. Use the smallest amount of flour you need to keep the dough from sticking. Gently roll each piece into a thin cylinder, stretching it out as you roll it. Transfer to a baguette pan if you have one, or onto a sheet pan with a baking mat dusted with cornmeal. Cover with plastic and let the loaves just sit there until they've doubled in volume, which will take 60 to 90 minutes, depending on the temperature of your kitchen. It's a good idea to lightly flour the plastic so it doesn't stick. Toward the end of this time, preheat your oven to 475 F.
When the loaves have doubled in volume, brush them with water and use a razor, or a very sharp knife, to make one long slash down the length of the loaves, or a series of diagonal slashes. Place a pan of hot water on the bottom rack of the oven and place the loaves on the center rack. Bake for 10 minutes, then remove the pan of water, rotate the pan and bake for another 10 minutes, or until the loaves are a deep golden brown. Then slice or just tear into them and enjoy. Note that there's no kneading involved here, and the dough is going to be very sticky, which is important, because it's the moist consistency of the dough that will give the baguettes their chewy texture. You'll also want to bake the baguettes with a pan of hot water in the oven for the first half of the baking time. It's the steam that gives the baguettes their crispy crust. A baguette pan will help the loaves hold their shape, but if you don't have one, you can use a regular sheet pan.